Brother and sister. Tail end of the craziest family you ever heard of. 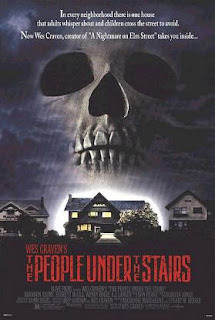 From Wes Craven The People Under the Stairs is a bizarre film, a journey into the minds of crazies as seen by Fool, a 13 year old boy trying to help his family. Fool (Brandon Quintin Adams) needs money to buy medicine his mother needs and is taken on a burglary by Leroy (Ving Rhames). They, accompanied by Leroy's partner attempt to burgle the house of Fool's family's landlords (credited only as Man and Woman). But inside the house they find far more than they bargained for. "Man" and "Woman", as we are led to believe are brother and sister, live together - we assume - in an incestuous relationship. Man wears a gimp suit. There is an abused young girl living there who believes herself to be their daughter, but who isn't. There are people living under the stairs. There is a young man living in the crawl space with no tongue. I would say that it only sounds weird on paper, but I'd be lying. True, the film is inherently strange, but it is also monumentally watchable and enjoyable. Writer/Directer Craven gives the viewer a taste of what's to come in Scream four years later. Spattered with dark humor and splattered with blood, the tale twists to the very end. It's creepy, without doubt. The acting is good, especially from Adams, as such a young and inexperienced actor. Everett McGill as Man, shines. Even the dog is good. It's a disturbing story when you sit back and think about it. The connotations of the actions suggest far worse things than are presented on screen. 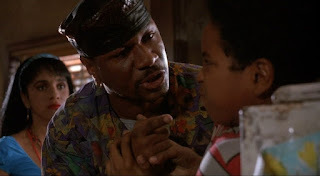 But the film is comedic with a deft touch. If you like horror and comedy, this is for you. WOW! How is it I haven't seen this one. Great review. Added to my viewing list.